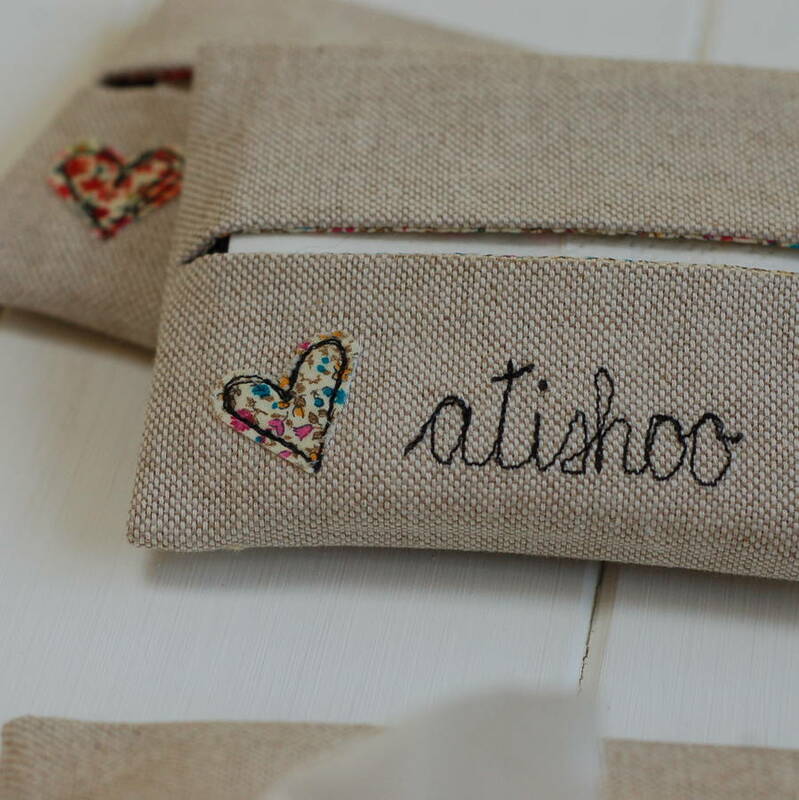 This beautiful linen and Liberty print tissue holder makes a stylish token gift or stocking filler. Handy for seasonal sniffles and make up fixes. 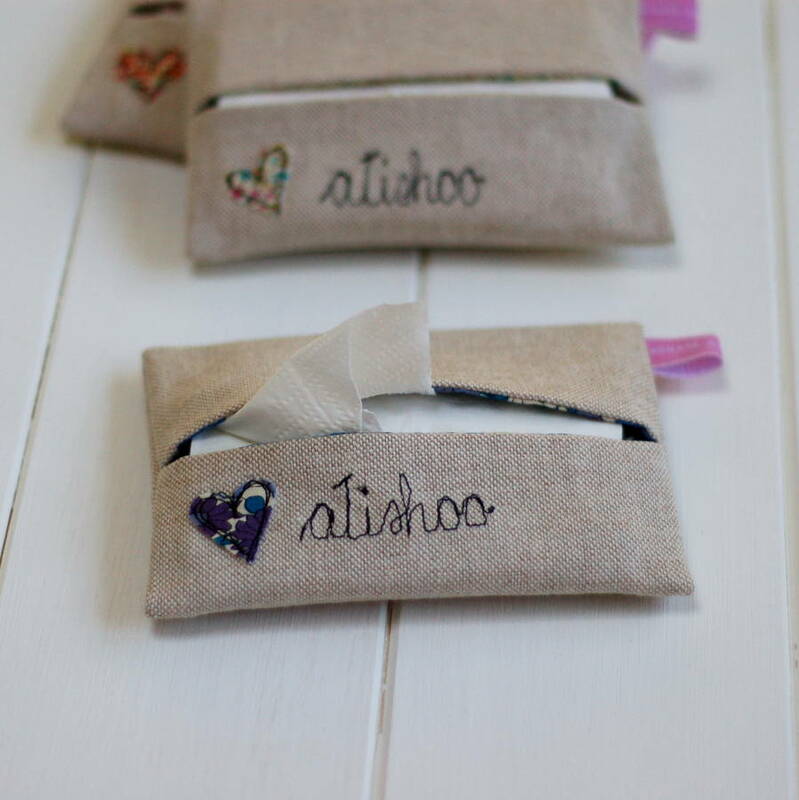 Add a little luxury to an everyday item with our tissue holders. 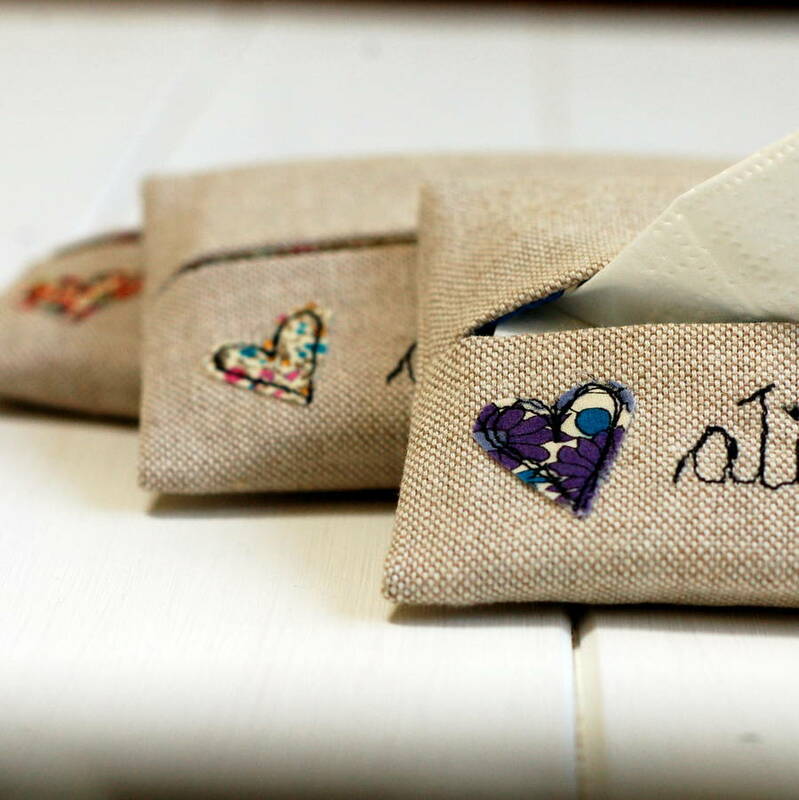 They make a quirky and unusual gift, perfect for friends and colleagues and look beautiful upon a desk, or in a your handbag. 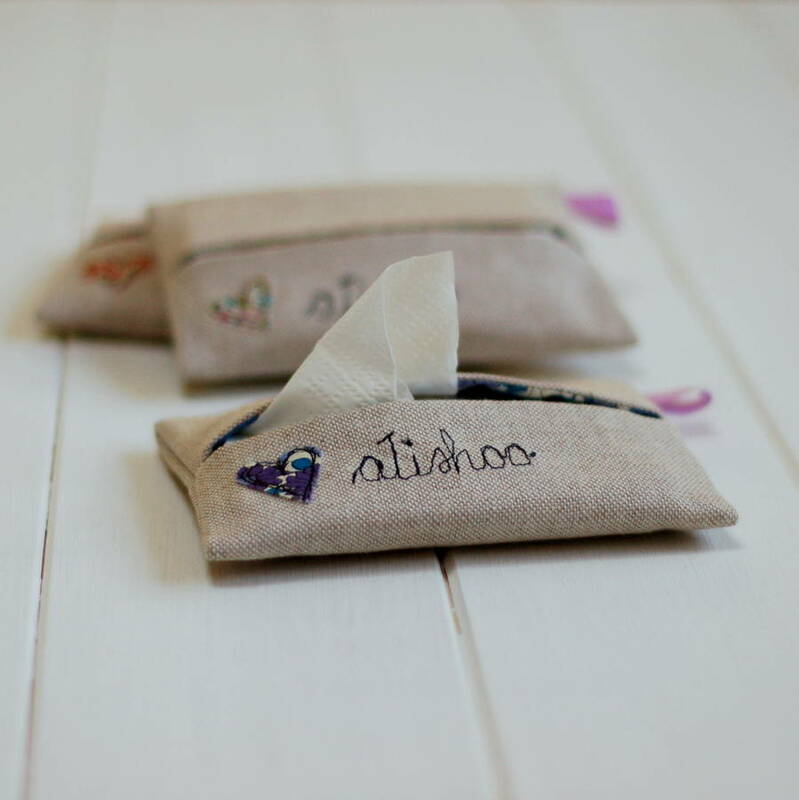 So much more stylish than a scruffy packet of travel tissues, and are sure to receive compliments from all who see them. 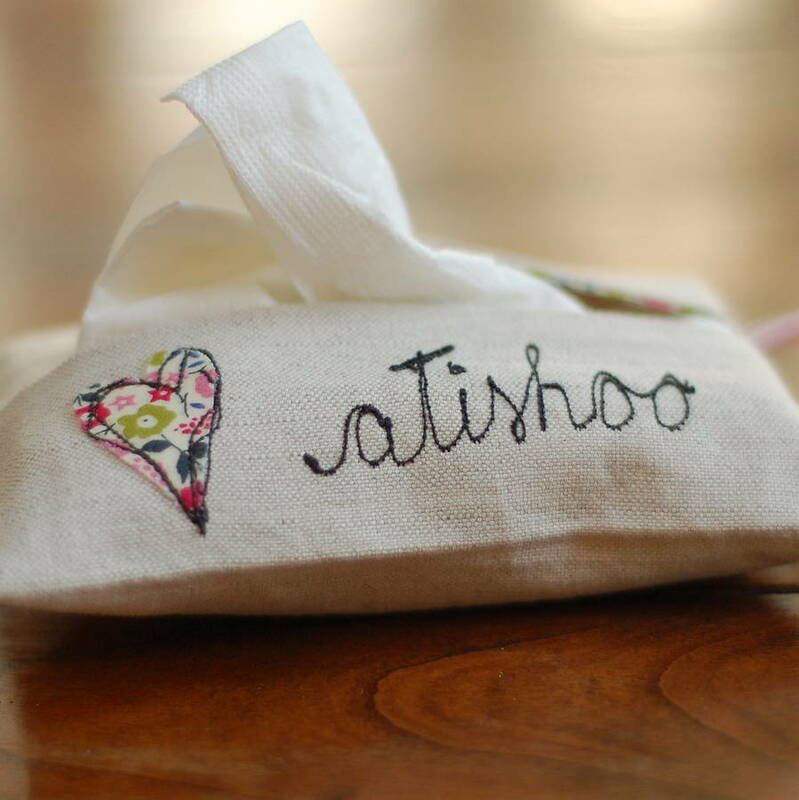 The outer fabric is embellished with a free-hand embroidery "atishoo" and a Liberty Print heart to match the lining fabric. 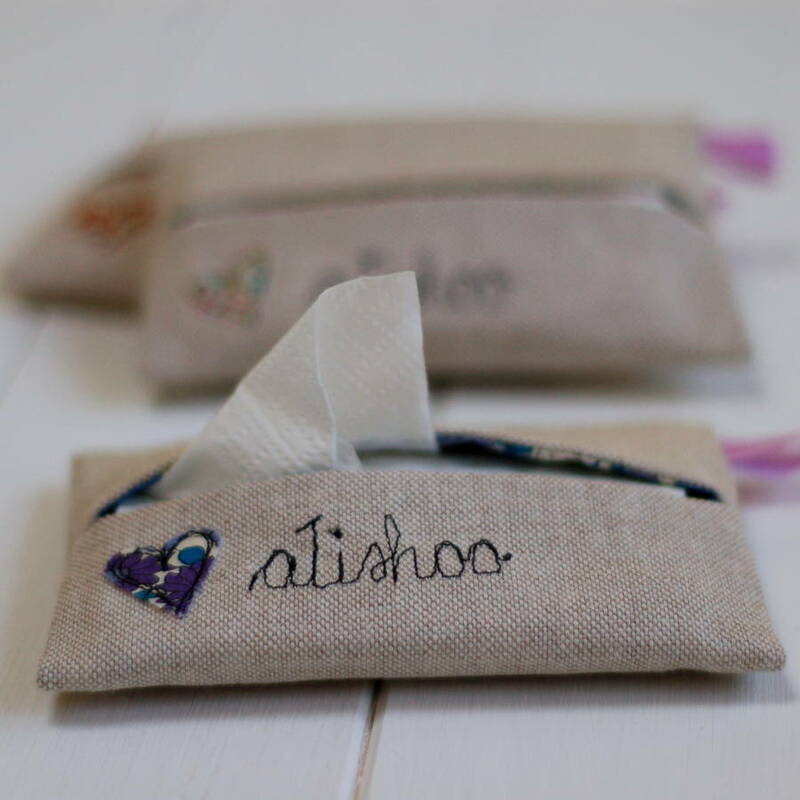 Each tissue holder arrives complete with a packet of tissues, ready to gift. and will fit perfectly into the smallest handbag. Availabe in natural ecru coloured linen and lined in a floral Liberty of London tana lawn cotton with matching appliqué heart detail. The co-ordinating Liberty floral print may vary from that shown but will always be from the gorgeous Liberty range of fabrics. We always carry a variety of Libert Prints so if you have a particular colour in mind please let us know and we will do our best to accomodate. 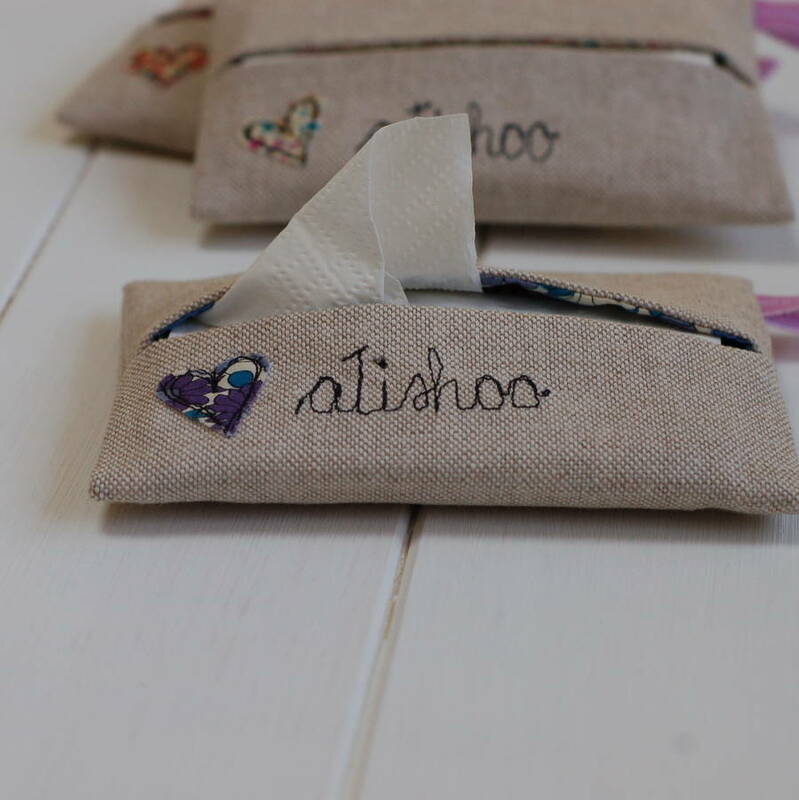 These tissue cosies co-ordinate perfectly with the other linen and Liberty print handbag essential items in our range, including phone cases and key fobs. Handmade in Britain from linen and cotton. 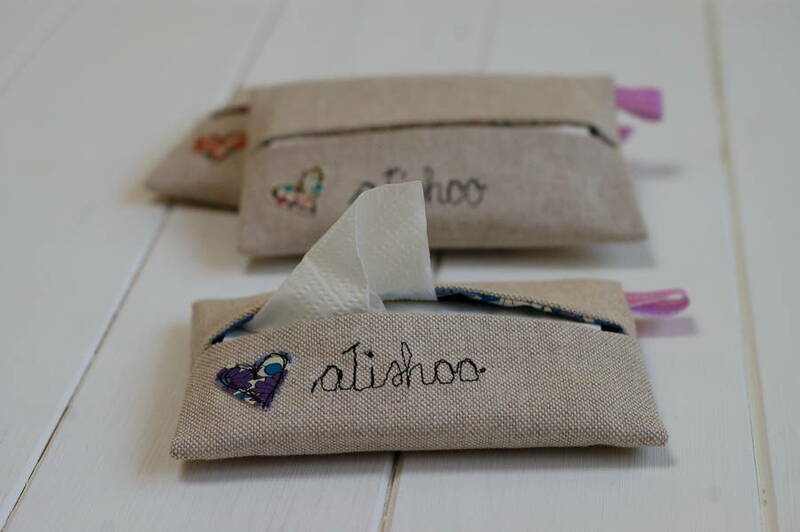 Each case will arrive complete with tissues and ready to gift. 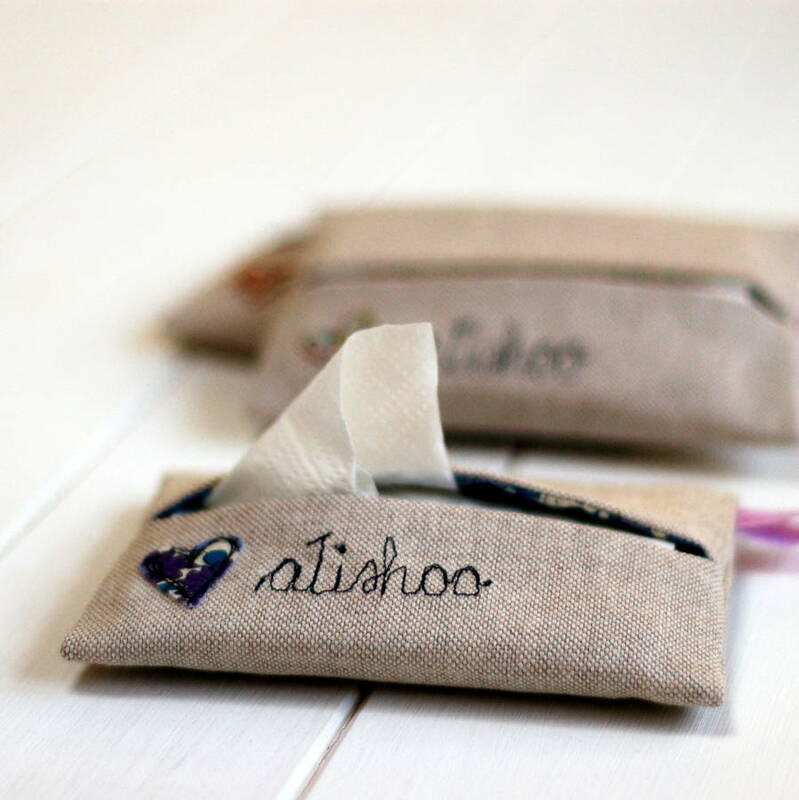 Cases measure approximately 9 x 13 cm and are designed to fit a standard packet of travel tissues. 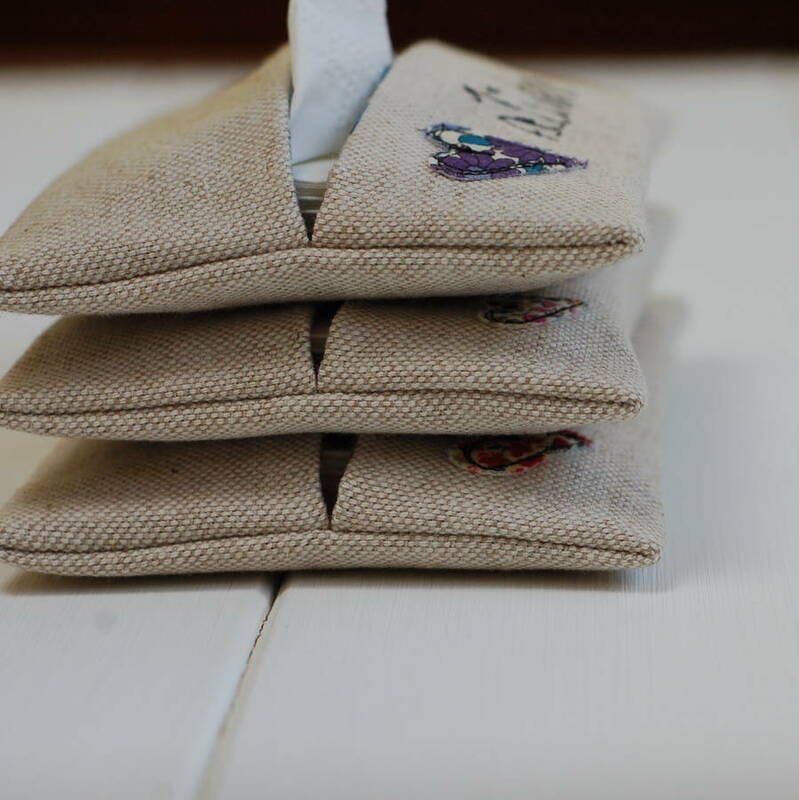 Please note that I offer free delivery on all UK orders and will refund any surcharge made to customers in Northern Ireland, Highlands and Islands. Unfortunately I am not currently able to override the automatic charge made at the time of purchase but I will refund the postage within 48 hours of ordering.